Whether you are a contractor, interior designer or a home homeowner searching for a company to create and install a staircase or remodel an existing stairway, we can help. We know you didn't come here simply to read a resume. What you wanted to find out was "Can they do the job and do it right the first time." The answer is that we can create and install any type of stairway system you can dream up. Whether it be luxury or something totally customized, we build it to the highest specifications of quality and to code. Our design staff will work closely with you to identify your needs and wants. We promise to "listen". 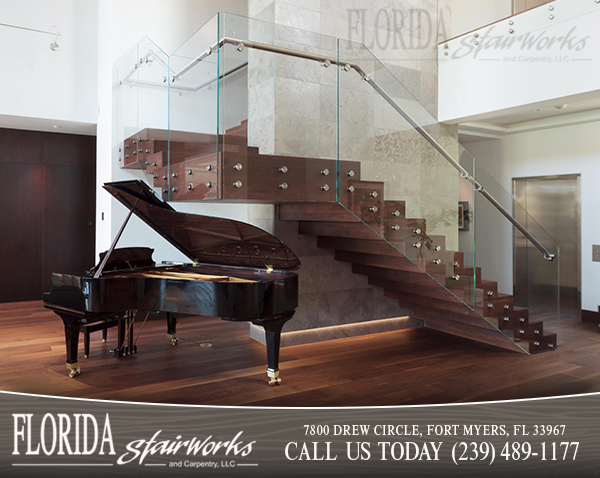 Florida Stairworks can custom build the staircase you have always dreamed of using raw materials such as natural hardwoods to reclaimed materials. We work with other mediums such as metal balisters, glass panels, and cable rail systems. We offer staircase styles ranging from contemporary and traditional historic reproduction, all the way to the exotic for homes, businesses and commercial applications. What you need to know most about us is that we follow through on every step of the project. Whether you are a homeowner, contractor or designer, you will never have to worry because we will be there for you each and every step of the way. For over 4 decades, we have learned what it takes to make our customers (you) happy. We make designing, building and installing stairways a simple process without stress, so you can get on with the business of enjoying life.